The relevancy of Paine in our contemporary world reverberates with a perennial question in political philosophy: how can we create, globally and locally, a sustainable moral community? Professor Raghavan Iyer describes the possibility of moral community: “If every man has some innate recognition of the true and good, enriched by active participation in a theater of political interaction, then a community of citizens is a moral community.” (p. 4 Parapolitics: Oxford Press 1979) Paine’s multifaceted principles, articulated by many presenters at the Conference, gives us clues as to how can we might revive a moral community and provide a rational basis for it without falling into sectarian religious belief, political, market, and religious fundamentalism, or without losing the gains in tolerance from moral relativism. A starting point for understanding moral community might be the “social contract” between man and man which results in a constitution for a contract between man and government. A fine Conference paper presented by Professor Carione Lounissi, University of Rouen, elaborated Paine’s idea of a social contract. She stated that Paine’s mention of social contract derived from a mixture of various theorists. While Paine employed both Lockean and Republican language, Paine’s position evolved into non-Lockean version of social contract in two important dimensions. Lounissi pointed out that for Paine, moral virtue was the basis of a social contract with fellow man and society. The political community was only an instrument in man’s hands and expression of a community of men. Everyone in society comes into agreement and the whole enters into a charter protecting every separate part. In society’s relationship to government, citizens must continually reinvent its compact out of which a contingent government derives. A compact is made with each other first to meet social needs, and a portion of rights is given up only derivatively with a government for the public good to constrain wickedness including excess private power and maldistribution. Paine’s view of conscience is much different than Locke’s. Paine believed in an interior, individual conscience as a defense against group coercion, however legalized; yet receptive to and refined through access to deeper moral principles in an emperyan consistent natural law and affections. Paine points to a Republic of Conscience, consistent with the U.S. Declaration of Independence; thus providing the basis for a continuous radical (i.e. standing on first principles) political posture regarding an ever renewing basis of social contract among men and derivatively with their government in a dynamic moral community. However, there can be more than one justification for a moral community. Professor Gregory Claeys’ conference presentation on “Paine and Rights” presented a puzzle. Paine’s early writings focused on rights “bestowed by the Creator”; thus the use of the logic of Divine origin of natural rights. Since the Creator is viewed as beneficent in an ultimately harmonious cosmos, we have a moral duty to imitate Him and do good vis-à-vis our fellow man and nature. But if, as Paine later suggests, that the Creation in Genesis are fables, then Claey’s raised the question of what do we have for the justification of rights? Claeys suggests that Paine begins to propose other justifications of human rights and social justice through Rights of Man, Age of Reason to finally Agrarian Justice. In Paine’s later writings, Claeys’ notes a secularization of the natural rights discourse in Paine’s writings. He relies on the modern, secular (i.e. not metaphysical) principle of human progress. “All rights claimed to improve society” are thus derived from human nature which is self-evident and universal. Thus rights theory moves from natural rights to human rights. Rights are not gifts bestowed, not given by men to men, but is an evolution of invention of rights as a human responsibility in and to society based on human nature, constantly extending inclusiveness and universality. Thus, in Agrarian Justice, Paine invents rights all citizens have to economic subsistence and property rents beyond basic political rights. Rights are extended and discovered from our work in society. Claeys noted that these secular justifications can become more problematic in application than a stricter appeal to the logic of the Creator. As a “gardener of ideas”, Paine employed both Natural Law and secular progress for a universal society, social justice, and human rights at different times. These justifications are different starting points for Paine’s constant: the existence of an underlying moral community and movement toward a universal society. Arguments for a moral community can either rest on our “shared species nature”, where our interior social sympathy and a wide range of empathy toward other human beings and nature form the basis of our interdependence in fact, not opinion. Or, the basis of a moral community, can be justified with an exalted view of Natural Law reflecting Divinity-in-Action. Paine’s Deism saw Divine expression in aspects of natural law, including human nature, and he rejected a capricious God. With his deeply religious views, Paine kept his Deist metaphysical principles, but expressed them in a more secular, modern mode. The increasing separation of religion and society (secularization) was highlighted by Professor Matthew Rainbow Hale, Goucher College, who spoke on “Apostles of Freedom: Thomas Paine and Pro-French Democratic Crusaders in the Early American Republic”. In the early 1790’s there was a brazen religious crusade in America to generate a secular society led by Francophile “democrats” which complimented American “republican” views of government. Hale described how this trans-national, egalitarian movement employed democratic religious symbols, ordering society around new ideals with new or regenerated terms like “civilization”, “society”, and “nation”. Society and traditional religion were not viewed as coextensive. The Pro-French crusaders emphasized the “disenchantment of society”, separating religion from the secular. Following Deist examples, they wanted to establish fraternal organizations in order to restore true or natural religion from institutional religion and atheism, placing faith in equality of man, human agency, and natural religion. This radical democratization of rights was consistent with Paine’s thinking. This American movement reflected the French experience after the Revolution in certain areas of France. Former subjects were enabled into becoming free thinking citizens in consciousness, culture, and in human rights for a very short time. Directorates of Theophilanthropy (a Theophilanthropist: A lover of God and Man) were formed to erect a modern belief system based on universal citizenship to bridge the gap between revolutionary ideals and the common man. Thus, from the elite, a new system of beliefs and public celebrations around natural cycles would be disseminated to the masses, commerce would create thinking citizens rather than feudal subjects, and civil holidays and human agency would have radical new symbols. This actually took hold in certain areas of France for a very short time until the counter-Revolution occurred and Napoleon ascended the throne. Paine became disenthralled and returned to America. Did Paine apply an egalitarian impulse to Native Americans and African slavery in America? Matthew Jennings, Macon State College In his presentation, “’A Friend to the Indians?”: Thomas Paine and Native Americans” pointed out the tension between idealizing the basic humanity of Indians yet using rhetoric for certain purposes describing Indians as a more primitive people. He describes them in his writings as “noble savages” and other times as “brothers”. Paine uses the language of the times. He did negotiate a treaty with the Indians but the Continental Congress abrogated it. At one point, Paine characterized native Americans at one point as innocent people of nature, writing that the British could stir up Indian savagery though Indians were less savage than the British King. Paine later made mention of a primitive state of man referring to Indians where there are not spectacles of human misery and poverty such as seen in more “civilized” nations. Thus, the issue was posed as to how Native Americans and other indigenous peoples were to be understood in a new nation and in broader society in the accepted language of the day. Paine was aware that the ferment of radical ideals, while pointing to a moral community, could be eclipsed or inverted through militarism and corruption of power. Jake Hogan, University of Toronto, “The Second American Crisis: Politics toward Censorship, War, and the Banks” brought Paine’s ideas into clarity and current relief. Paine warned against “suspicion campaigning of mean souls”, the ascendancy of “civil and martial spheres” with the lucrative nature of war profiteering. Basked in secrecy and the lack of transparency, similar to today’s national security state, the corrupting influence of a militarized state does not allow dialogue without fear and thus is against the public good. Furthermore, Hogan pointed out that Paine warned against a centralized banking system, especially when coupled with printing money for payment of war debts. This creates corrupted paper money which devalues merit and trust in social exchange. These circumstances lead to inevitable centralization which is the opposite of democracy. Thus, what might be some of the ways to regenerate a moral community today? One might become aware of the decline of public reason and public memory. In the “Erasure of Public Memory: The Strange Case of Washington, D.C.”, Professor Richard Robyn, Kent State University, recounted how there is no trace of public memory of Tom Paine in Washington D.C. (the “Federal City”) . With exception of a Congressional enactment which is now eclipsed due to statutes of limitations, there is no provision for a statute of Tom Paine in Washington D.C. Nonetheless, when his Washington D.C. class retraced Paine’s steps in Washington D.C. through visits with Jefferson, they discovered that Paine stayed at a Lovell Hotel when visiting Jefferson. The Lovell Hotel sat where the Willard Hotel now stands. So far, the class has not been able to get an “historical marker” placed there, despite their evidence, but with a shift in ownership, there is another opportunity. Robyn thus makes the case that public memory is an important aspect for civic education and moral renewal. For loss of public memory means loss of heritage and bequeathed wisdom. A second related modality for moral and civic regeneration would be to reconnect and understand basic principles which Paine and others espoused and their applications today. Professor Marc Belissa, University of Paris Ouest Nanterre spoke on “Thomas Paine’s Lessons on Republicanism”. 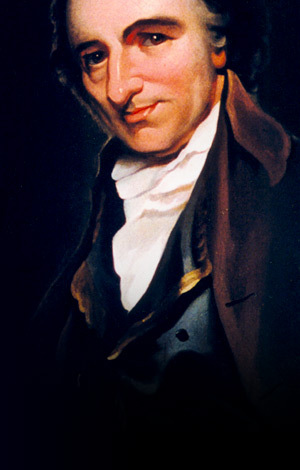 He remarked that contrary to the image of Paine as a “broken man” when he returned to America from France at the end of his life, Paine vigorously pursued his principles and involvement in politics through his “8 Letters to the Citizens of the United States” in the National Intelligencer during the Federalist era. These letters were in response to a faction (a faction is not based on political principles) which Paine thought subverted the principles of the Republic. It seems that we need more sophisticated debate, beyond images and invective, distinguishing “factions” whose motive may be to dis-able popular government from the reasoned applications of political principle in a civil dialogue with others. This dialogue is an arena for, as James Tepfer has expressed, creatively applying principles to particulars which Paine so exemplified in his dialogues with opponents and his detailed studies of constitutions and taxation schemes. Paine desired political renewal. Belissa pointed out that Paine signed his letters “Spark from the Altar of 76” so as to bring back the revolutionary memory of the original moment. Belissa stressed that the original moment, for Paine, was not so much about Independence, but as the basis for renewing the world. At the end of the Conference, a participant mentioned that we may have heard three Thomas Paine’s: “the American”, “the English”, and the “French”. Scholarship and access to national sources are segmented, and there was the hope expressed that more joint scholarship and exchange could occur. However, there was some agreement among Conference participants that the thread that tied the life and work of Thomas Paine was his universal impulse for human rights, social justice, and the betterment of mankind. I would make an additional observation: a strong underlying theme of the conference was Paine’s ideas about how to continually extend principles of universal society consistent with human nature in theaters of political participation which express a moral community for res publica (the public, not the private good). A conference such as the one sponsored by Iona College and the Tom Paine National Historical Association enabled fine and delightful presentations, opening up new roads of scholarship, dialogue, public memory, and meditations on contemporary application.